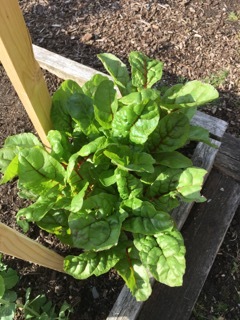 Growing Swiss Chard - Everything you need to know. Swiss Chard is probably the most popular leafy vegetable after spinach for cooking. It is easy to grow and will do well during the spring and summer months. This vegetable can be direct seeded or transplanted. I like to transplant this vegetable that way there is no thinning to be done on your hands and knees in the garden. The more you pick off the outer leaves the more the plant will continue to grow. This vegetable will also do well in containers. Location - Sunny, well drained. Soil - Rich, fertile loam with neutral pH 6.5-6.8. Soil Preparation - Grows well after a green manure crop. Dig in 3 inches of compost or aged manure before planting. Add lime (5 pounds per 50 inches bed) if soil is acidic. Planting times - Sow late May; transplant at 4 weeks. Sow mid June to mid July for fall planting. If direct seeding plants will need to be thinned. Planting Instruction - Likes cool temperatures. Watering - Water regularly at the base of the plants. If you sprinkle the large leaves may impede water from getting to the soil. Weeding - Keep weeded while plants are small. Harvest - You can cut the whole plant but usually harvested by cutting outer leaves when they are 6" or more in length. Leaves can be cut several times during the season. Must be cooled quickly by getting them into refrigerator as soon as possible. Storage - Is best stored in a sealed plastic bag or container in the refrigerator. It is best to use within a few days as it loses nutrients after the first few days.